Back in October last year, myself and my brother went on holiday to South Korea for a week, followed by two weeks in Japan. 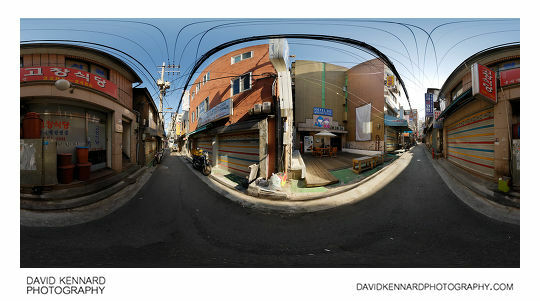 On the first day when we arrived in Seoul, we just found the hotel then went to sleep. 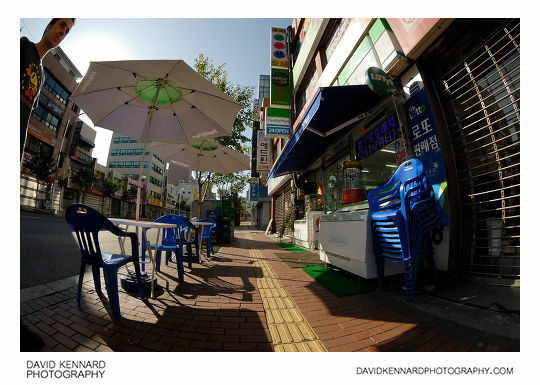 On our second day though, we went on a walk up Namsan, which means 'South Mountain'. Strangely enough, we started off outside the hotel. The hotel was quite difficult to find initially, being down one of the small side streets, which don't seem to have names. House/Building numbers don't tend to be used in South Korea either – buildings are given numbers, but the number just means it was nth building built in that neighbourhood. Thankfully, I had found the Hotel on Google Earth before we left Britain, and programmed its co-ordinates into the GPS unit, making the general position of the Hotel relatively easy to locate. Down the street I noticed this modified bike used for paper delivery (there were a lot of print shops in this area). I found the little decals on either side of the windshield quite funny. You might notice that my shadow is on the bike, but not on the ground. Personally I don't like my shadow in images, unless my shadow is the focus of the image. Taking a photo with your back to the sun while using a wide-angle lens, it's pretty hard to avoid your shadow being in the image, so I removed the shadow from the ground in Photoshop. The shadow on the bike was too difficult to remove, and I don't find it as distracting as the shadow on the ground was. At the end of the street was a telegraph pole / lamppost with wires coming off it in all directions. I know Seoul has a very fast Fibre Broadband network, but I don't know if they run these cables through the air (instead of underground). 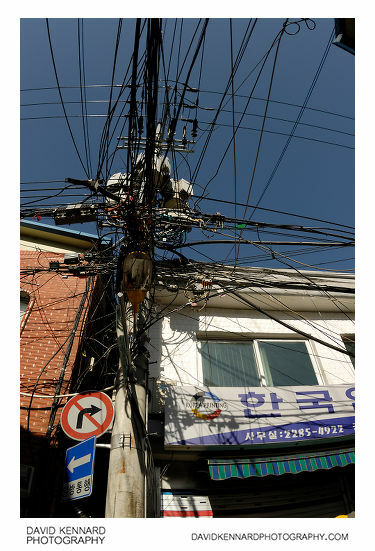 Either way, it's still a lot of wires. We had been surprised that the shops were closed down the side streets, and also there was no-one else around. 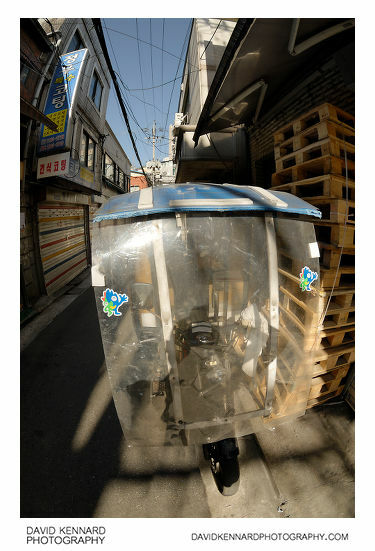 Then when we got out onto the main street near our hotel, Euljiro-3(sam)-ga – 을지로3가, we were even more surprised that all the shops on this main road were closed, and there no-one here as well. It seemed a bit like a ghost town. 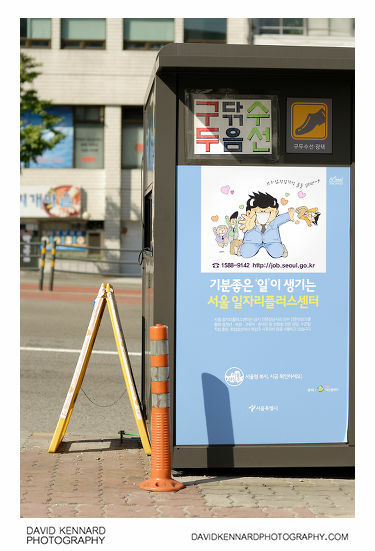 I found out later that this was because it was National Foundation Day, a national holiday in South Korea. My brother Mauser (as he is currently known, though his designated name varies over time) decided to pop his head in this image, and due to the distorted effect of the fisheye lens, he looks like he must be standing on top of box (he wasn't). A bit further along Euljiro-3(sam)-ga we came across a small structure on the pavement, with a picture of a shoe on it. 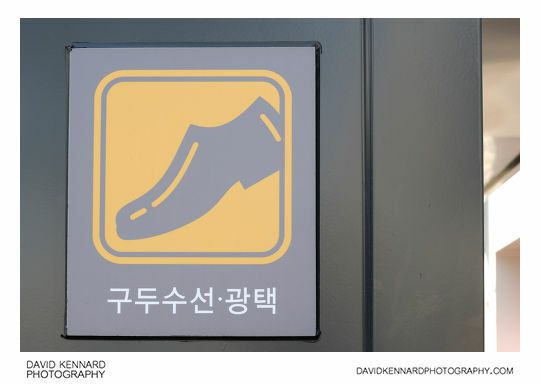 Although I wouldn't have thought that shoe shining and repair services were in such great demand that the government would install specific structures for sale of these services, these shoe-shine/repair structures were relatively common on the main streets of Seoul.